logs.view_administrator_handlers This view selects the handler configuration for the Actions menu. logs.view_captured_objects This view selects database objects and related change tracking framework information. 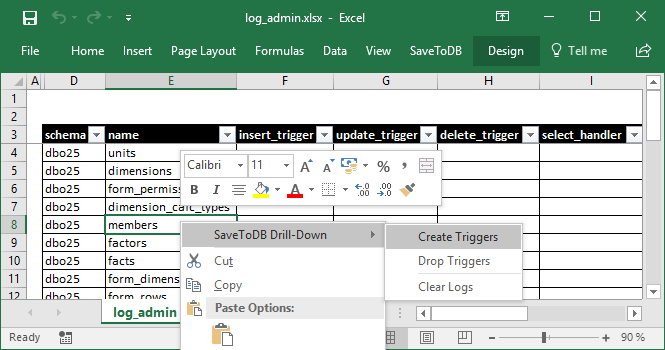 logs.view_query_list This view selects framework objects for the SaveToDB Connection Wizard and SaveToDB Query List. logs.view_translations This view selects the translation configuration for the SaveToDB add-in. logs.view_user_handlers This view selects the handler configuration for the context menu. Use DENY SELECT on this view to disable the feature. This view selects database objects and related change tracking framework information. Use this view to configure and check change tracking triggers. The view selects framework objects used to connect in Excel, logs.base_tables and logs.view_objects. This view selects the translation configuration for the SaveToDB add-in. This view generates the translation of the logs.view_handlers handlers for the SaveToDB add-in. This view selects the handler configuration for the context menu. This view generates the event handler configuration for captured tables and derived objects configured in the logs.base_tables table. Such handlers allow using the context menu to check and revert changes.